WE ARE WAY MORE CONNECTED UNDER THE GROUND THAN WE REALIZE! 1-16-11 DREAM: i was living in southern Wisconsin, and my mother-in-law came to visit our family. She drew us a map of the Eastern half of the United States and drew lines on it that included all the ancient magma tunnels under the surface that were going to soon let lava flow from an ancient volcano that was soon to come to life in North//South Carolina, and work its way all the way up through all the states up to Wisconsin. The map she drew us went all the up to the Wisconsin River area west of Madison, WI. She said that it was due to come to life and it was dangerous to stay anywhere in the vacinity of theh entire map but the worst would be in Wisconsin where the magma would finally come out of the ground. She told us that we would have to go all the way up into Canada to be safe. My husband had a couple days of work left on the job he was doing, and she said we would have that time left, but no more and we'd have to take our children immediately then and leave the state into Canada. That's all the warning we would get because when the ancient volcano came to life, there would be little warning. .
An old Ohio riverbed curved sharply westward, just south of present Golconda in SE Illinois (thin dark blue on top map, yellow on smaller map below, increasing in width westward) running a few miles south of the present Illinois Route 146. Most of the dark blue of Illinois in upper map is the present Cache River Basin and Natural Area. 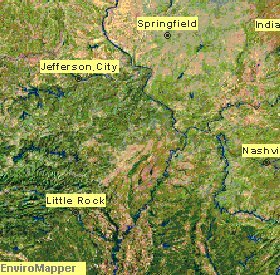 The old river bed continued near Olive Branch IL, Commerce MO, along ridges near Benton and Morley, MO, then south through flatland into Arkansas. 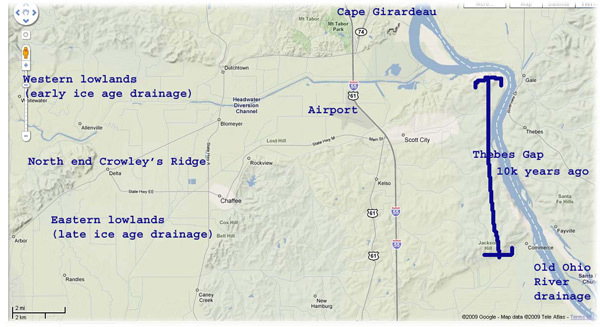 The darker blue (top map) of the old Mississippi River bed curves sharply west at the regional airport between present Scott City and Cape Girardeau. Draining the larger swamp - in Southeast Missouri - in the early 20th century is a separate story. See numerous north-south ditches on the map. more In the southern bootheel, five drainage ditches run alongside each other as they drain into Big Lake, a large shallow swampy lake formed in 1811. 1200 px 1892 map of Crowley's Ridge. The Eastern Lowlands beginning near the community of Delta, include the "Bell City-Oran Gap" (both towns are on current maps) on the east side of Crowley's Ridge. The layered rock outcroppings on the low hills near Chaffee and Oran appear smooth and pitted. [ref.] It doesn't take much imagination for an observer to see this was once a wide, shallow river bottom. 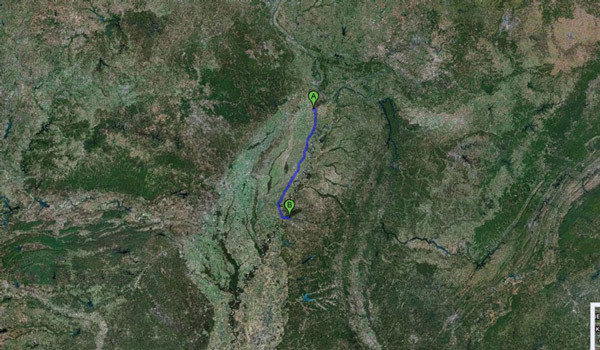 The Ohio River may have even joined the Mississippi at Morley, between Benton and Sikeston, for a time. See the green strip on the map at left, southwest of the current confluence of the two rivers. This is the Crowley's Ridge separation between the eastern and western lowlands. The glacier runoff deposited much sand and light dusty soil in these areas. The rivers eroded some of this sandy alluvium and formed a newer and lower flood plain in a portion of the valleys. The older and higher flood-plain surfaces that have been left are terraces. The four glacial stages, Nebraskan, Kansan, Illinoian, and Wisconsinan, are named for their most southerly advances. The Wisconsinan stage covered much of the northern United States from the Atlantic coast to the Rocky Mountains as recently as 12,000 years ago. Global warming??? Bosh and poppycock. It's only temporary. Swamps and marine life covered much of Illinois, south of the Quad cities to Mt. Vernon (during the Pennsylvanian age). 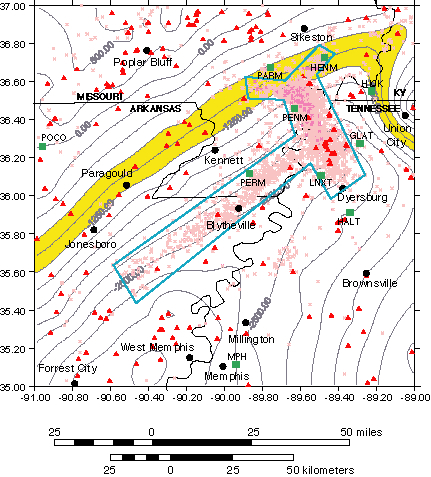 Some geologists believe the heavy seismic activity along the Commerce Lineament, about 10,000 years ago helped the Mississippi River cut through the "Thebes gap" (about 12 miles, between Thebes IL and Commerce MO) and make a new confluence at Cairo, IL. It then switched from a braided river to the meandering river through rock cuts that forms the state boundaries today. Here's an infrared view | another. The Mississippi in older days migrated rapidly by eroding on the outside of a river bend and depositing point bars on the inside of the river bend. Abundant oxbow lakes mark old positions of the channel that have been abandoned. Native Americans liked to settle along these oxbow lakes because the fishing, hunting and water supply was good, but the threat of flooding was less than along the river. 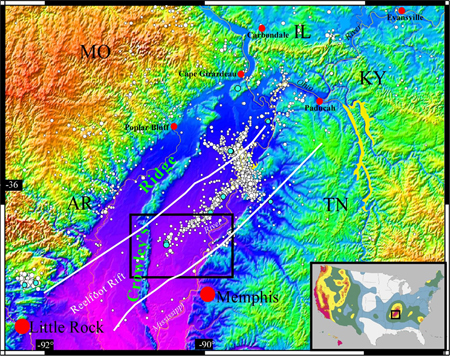 Researcher Margaret Guccione with the University of Arkansas finds the Mississippi's path changed significantly at the time of the AD 1450-1470 New Madrid earthquake. The land at Reelfoot appears to have risen four meters in 1,000 years - quickly in geologic time. Only part of that can be accounted for in the 1811-12 quakes, she said. The rise, along with sinking of some land, blocked the flow of a creek to create Reelfoot Lake. 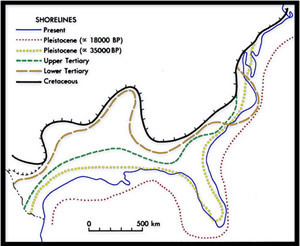 Saucier, Roger T., 1994, Geomorphology and Quaternary Geologic History of the Lower Mississippi Valley. 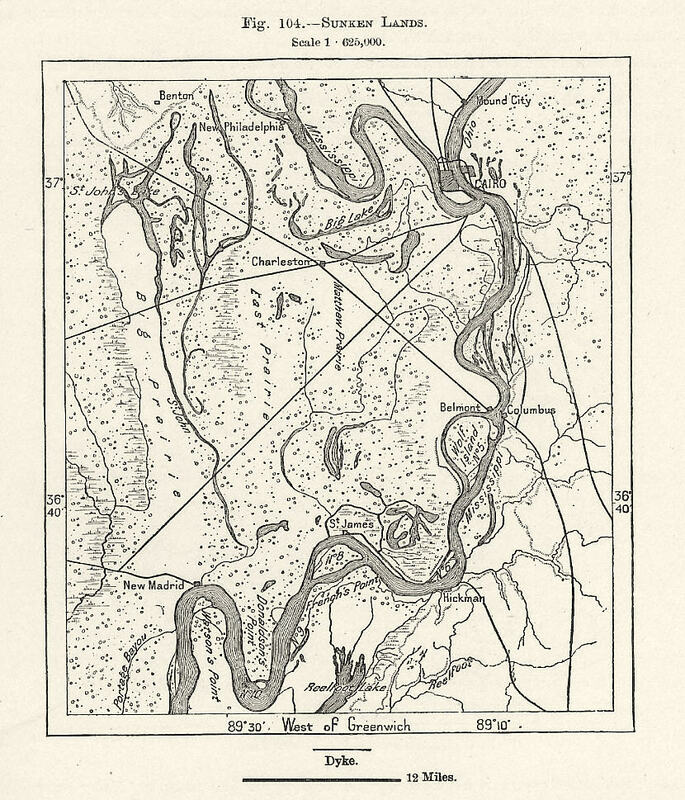 Mississippi River Valley Commission, U. S. Army Corps of Engineers, Vicksburg, Mississippi. Writing in the January 2007 issue of Scientific American, Roy B. Van Arsdale and Randel Cox of the University of Memphis offered the following explanation of the embayment's complex origin. 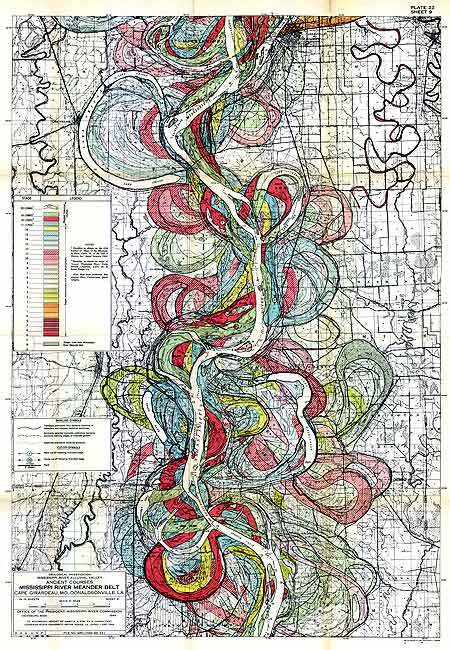 (Below) Contour lines show where a shallow Gulf of Mexico once covered the lower Mississippi Valley to Dexter, MO, and just above the junction of the Ohio and Mississippi Rivers at Cairo, IL. (See a great explanation.) Its sandy sediment deposits make the ground even shakier in earthquake territory. It was called the Mississippi Embayment Synclinorium. Until approximately 20,000 years ago, when glaciers were at their maximum extent, sea level was some 125 meters below its current level, and nearly all of the present-day continental shelf was exposed. Below: Texture of old barnwood? Point A is Knoxville, TN. Point B is Kingsport. White spots in lower right are clouds. The lines are the Appalachian Mountains, with some Smokies and Blue Ridge thrown in. They were formed when Africa pushed toward the Eastern US, way way back. USGS topography map of region near Cairo IL. See other satellite topography maps lower on this page. Old paths, meanderings of Mississippi River over the centuries. (Makes nice artwork!) This comes from the Corps of Engineers... section from Cape Girardeau Mo, southward. An artist who made pictures with sand and glue, told us he found 25 different colors of naturally occurring sand just in Stoddard County, (Dexter) MO at the north edge of the Bootheel. He believes the sand colors were formed when this landlocked area was a seashore. A MO Department of Natural Resources person told us the underground water table in the Bootheel is sloped such that people in the southern Bootheel are now pumping water from their deep wells and community water systems that fell as rain, a million years ago, just north of the Bootheel. 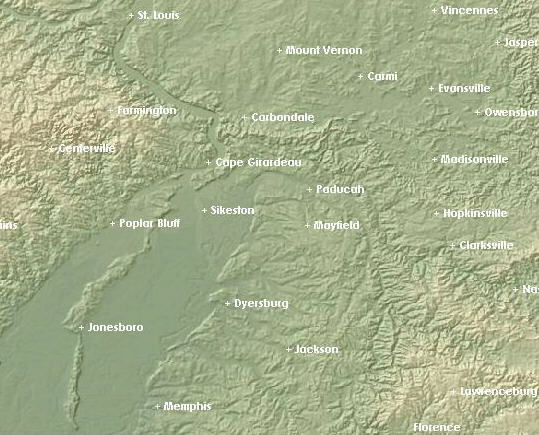 The town of Marble Hill, in Bollinger County, half an hour west of Cape Girardeau, has dinosaur remnants that were trapped in a seismic fault south of town. Townspeople have opened a Natural History Museum. It's the only dinosaur found for many hundred miles. The duck-billed Hypsibema crassicauda probably weighed two tons, was 10 feet tall, ate plants, and lived 100 million years ago. News story. Read about the Cretaceous period | Southern Illinois dinosaurs? 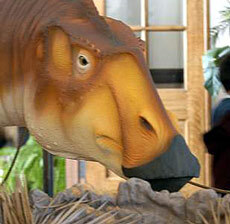 Missouri's dinosaur was part of the Hadrosaur family. Note in map below - the grey streak across southern Illinois and southeast Missouri of Middle Cretaceous times, which are places where dinosaur bones might be found. 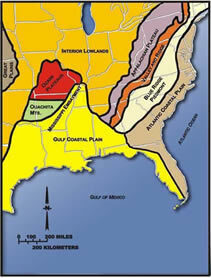 Also note the yellow of the Great Plains, which at that time was a great ocean. One and a half billion years ago, hot volcanic ash and gases spewed into the air, then cooled, forming igneous rock. Later, shallow seas covered the rock, depositing sedimentary rock. The land rose. The sea fell. 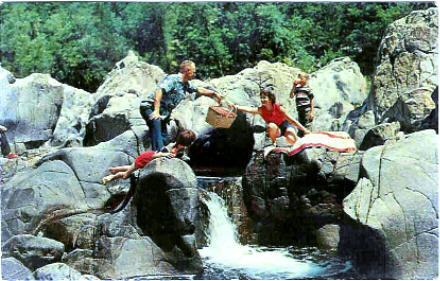 It created Johnson's Shut-Ins, near Ironton, Farmington, southwest of St. Louis, ... and Elephant Rocks (lower picture), nearby. 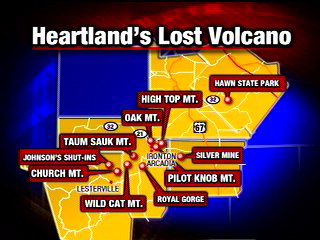 KFVS 2007 look at old volcano in SE MO's Mineral Area says it was probably centered at Taum Sauk mountain. Learn More About Plate Tectonics and the "Ring of Fire"
The Appalachians are old. A look at rocks exposed in today's Appalachian mountains reveals elongate belts of folded and thrust faulted marine sedimentary rocks, volcanic rocks and slivers of ancient ocean floor. Strong evidence that these rocks were deformed during plate collision. The birth of the Appalachian ranges, some 480 million years ago, marks the first of several mountain building plate collisions that culminated in the construction of the supercontinent Pangea with the Appalachians near the center. The Earth is approximately 4.5 billion years old. In the Southern Appalachians, the history of the last billion years is recorded in the rocks. By reading the rocks, we can trace their incredible history. The rocks at the core of the Appalachian Mountains formed more than a billion years ago. At that time,all of the continents were joined together in a single supercontinent surrounded by a single ocean. About 750 million years ago, the crust of the supercontinent began to thin and pull apart. As the crust expanded, a deep basin -- the Ocoee -- formed in what is now the western Carolinas, eastern Tennessee, and northern Georgia. Seawater filled the basin. Sediments formed by the weathering of surrounding hills were transported by water and deposited in layers on the floor of the basin. Over a long period of time, a great thickness of sediments accumulated. These sediments now form the bedrock of the Great Smoky Mountains. Within these sediments, minerals like pyrite and metals like copper were deposited. At the same time that the sediments were being laid down volcanoes were erupting in present-day Virginia, the Carolinas, and Georgia. Lava from some volcanoes flowed in slow moving sheets, but some eruptions were explosive. Then, about 540 million years ago, the supercontinent split into pieces that drifted away from each other. Seawater spread into low areas between crustal plates and,in time, formed new oceans. A shallow sea covered most of what is now the United States. About 470 million years ago, the motion of the crustal plates changed, and the continents began to move toward each other. Eventually, about 270 million years ago, the continents ancestral to North America and Africa collided. Huge masses of rock were pushed west-ward along the margin of North America and piled up to form the mountains that we know as the Appalachians. As blocks of continental crust rode across one another, some rocks became so hot that they melted. Some of the molten rock remained deep below ground. There, it cooled slowly and crystallized to form bodies of rock that are called plutons. Granite is an example of an plutonic rock. Some molten rock cooled very slowly and formed coarse-grained veins called pegmatites. Pegmatites have been the source of high-purity minerals (such as feldspar,quartz,and mica) and gemstones (such as emeralds and beryl). When continental masses collided with the edge of ancestral North America, rocks were subjected to intense pressure and heat. Where the temperature was high but below the melting point of the rocks, the rocks deformed and recrystallized to become metamorphic rocks. The components separated into bands, and some flowed with a consistency like that of toothpaste. During metamorphism, temperatures and pressures can vary. In less extreme conditions, original rock layers may be partly retained. As a result, some minerals recrystallized in sheets, forming rocks (slate or schist) that split easily into thin, smooth layers. The collision of continental plates is also expressed in the rocks by folds (bends)and faults (breaks). Earthquakes happen because of slippage along a fault. Although earthquakes are now rare in the Southern Appalachians, during the time of continental collision, earthquakes were a common occurrence. Although a collision of continents caused the formation of the Appalachian Mountains, the present-day margin of North America is the result of a reversal in crustal plate movement. After the continents collided, the continental mass began to pull apart. About 240 million years ago, at the beginning of the age of the dinosaurs, a new ocean basin began to form -- the present-day Atlantic. The widening of the Atlantic Ocean at the mid-Atlantic Ridge is evidence of this continuing movement. At the time they formed, the Appalachians were much higher than they are today -- more like the present-day Rocky Mountains. While the Atlantic Ocean was still in its infancy, the Appalachians were already being attacked by erosion. For the last 100 million years, erosion has carved away the mountains, leaving only their cores standing. Erosion continues today and is constantly altering the landscape of the Southern Appalachians. Four times during the past 2 million to 3 million years, great sheets of ice advanced steadily southward from the polar region. The glaciers did not extend as far south as the Southern Appalachians, but they triggered a change in climate that can be seen today in both the rocks and the life of the region. Excerpts from: USGS/NPS Geology in the Parks Website, August 2001, and Sandra Clark, et.al., 2001, Teacher's Guide for the U.S. Geological Survey Video -- The Southern Appalachians, A Changing World. The Appalachian National Scenic Trail is a 2,167-mile (3,488 kilometers) footpath along the ridge crests and across the major valleys of the Appalachian Mountains from Katahdin in Maine to Springer Mountain in north Georgia. The trail traverses Maine, New Hampshire, Vermont, Massachusetts, Connecticut, New York, New Jersey, Pennsylvania, Maryland, West Virginia, Virginia, Tennessee, North Carolina and Georgia. Most of the rocks that form the Blue Ridge are ancient granitic and metamorphosed volcanic formations, some exceeding one billion years in age. By comparison, humans have been associated with this land only about 9,000 years. The Blue Ridge Parkway extends 469 miles along the crests of the Southern Appalachians and links two eastern national parks: Shenandoah and Great Smoky Mountains. In many places along the Blue Ridge Parkway, there are metamorphic rocks (gneiss) with folded bands of light-and dark-colored minerals, which sometimes look like the folds and swirls in a marble cake. Great Smoky Mountains National Park lies within the Appalachian Blue Ridge geologic and physiographic province. The highest mountains in eastern North America occur in the Blue Ridge province, and some of the highest peaks in this province are in the Great Smoky Mountains National Park. The oldest rocks in the Blue Ridge province are at least 1 billion years old and consist of metamorphosed sedimentary and igneous rocks. These Proterozoic rocks form the core of the ancient Appalachian Mountains. Sediments deposited over these older rocks form the majority of rocks in the Great Smoky Mountains National Park. Most of the rocks in Great Smoky Mountains National Park are metamorphosed sedimentary rocks. These sedimentary rocks were formed from approximately 800 to 450 million years ago from deposits of clay, silt, sand, gravel, and lime or calcium carbonate. The oldest sedimentary rocks consist of vast amounts of clastic material that washed down into lowland basins from adjacent highlands. Rocks of the ancient highlands are similar to the ancient granite, gneiss, and schist found in the eastern parts of the Great Smoky Mountains National Park. Approximately 450 million years ago, the rocks were metamorphosed or "changed" by heat and pressure. For example, sandstone was changed to quartzite and shale to slate. About 200 to 300 million years ago, the last phase of Appalachian Mountain building, (the Alleghenian orogeny) occurred when the North American continent collided with the African and European continents, closing the early Atlantic Ocean. This process, part of a continuous mountain building cycle known as "plate tectonics," ended sedimentation in the Appalachian region and uplifted the entire Appalachian mountain chain from Newfoundland, Canada to Georgia. These mountains may have been much higher than they are today, with elevations perhaps similar to the present-day Rocky Mountains. As the continents collided, the original horizontal layers were bent or folded and broken by fractures and faults. Tremendous forces caused huge masses of older rocks to be pushed westward, up and over younger rocks, along nearly flat-lying faults. Rocks in the Great Smoky Mountains National Park moved westward on the Great Smoky Mountain fault. Granitic gneiss with foliation defined by bands of black biotite mica and white plagioclase feldspar is exposed near Cherokee (Cades Cove). At 1 billion years old they are the oldest rocks in the park. Shenandoah National Park lies astride a beautiful section of the Blue Ridge Mountains, which form the eastern rampart of the Appalachian Mountains between Pennsylvania and Georgia. The Shenandoah River flows through the valley to the west, with Massanutten Mountain, 40 miles long, standing between the river's north and south forks. The rolling Piedmont country lies to the east of the park. Skyline Drive, a 105-mile road that winds along the crest of the mountains through the length of the park, provides vistas of the spectacular landscape to east and west. The oldest rocks in Shenandoah National Park were formed between 1 and 1.2 billion years ago. 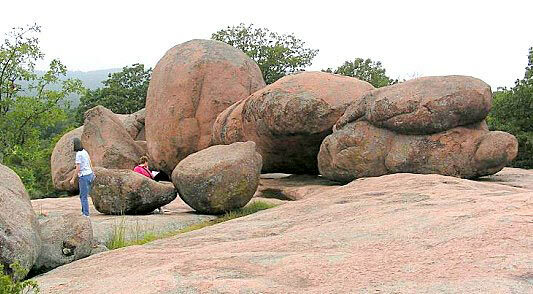 These granitic rocks can be seen at Old Rag Mountain and Mary's Rock Tunnel. Two other major rock types you can see in the park include basalts, made from individual lava flows, each 30 to 90 feet deep, formed about 570 million years ago; and sedimentary rocks (including sandstone, quartzite and phyllite) formed later. The flow that contains the columns of an extensive series of lava flows, each averaging about 200 feet thick, poured over the land more than 570 million years ago. Columns formed as cooling or shrinkage joints when a hot lava flow cools quickly; the columns form perpendicular to the cooling surface. Old Rag Mountain, Shenandoah National Park, in the Blue Ridge province of Virginia. The craggy rock peak is exposed billion year old granitic gneiss called the Old Rag Granite. Blue Ridge to the west is underlain by Late Proterozoic Catoctin Formation which is comprised of massive 575 million year old basalt metamorphosed to greenstone in the Middle Paleozoic. Blue Ridge forms the provincial boundary with the Great Valley of the Valley and Ridge province. Although volcanic activity ended hundreds of millions of years ago, rocks that formed from ancient volcanoes can still be seen at White Top Mountain in southern Virginia. Some rocks in this area contain angular fragments that had cooled and solidified, then later broke up, and were engulfed in lava flow. Others contain small, irregular, mineral-filled holes that formed as gases slowly bubbled up through hot lava. 8) Clark, et.al., 2001, Teacher's Guide for the U.S. Geological Survey Video -- The Southern Appalachians, A Changing World. North Carolina can be divided into three physiographic provinces: the Coastal Plain, the Piedmont and the Blue Ridge. Each province is characterized by particular types of landforms. Within North Carolina, 43 peaks exceed 6,000 feet in elevation and 82 peaks are between 5,000 and 6,000 feet. On the west, the Great Smoky Mountains is the dominant range with several peaks that reach more than 6,000 feet. On the eastern side of the North Carolina Blue Ridge, the highest range is the Black Mountains which extend for some 15 miles and contain a dozen peaks that exceed 6,000 feet in elevation. This group includes Mount Mitchell. At an elevation of 6,684 feet in elevation, it is the highest peak of eastern North America. Other prominent ranges from northeast to southwest are the Pisgah Mountains, Newfound Mountains, Balsam Mountains, Nantahala Mountains, and the Valley River Mountains. The Atlantic Plain is the flattest of the provinces. It stretches over 2,200 miles in length from Cape Cod to the Mexican border and southward another 1000 miles to the Yucatan Peninsula. The Atlantic plain slopes gently seaward from the inland highlands in a series of terraces. This gentle slope continues far into the Atlantic and Gulf of Mexico, forming the continental shelf. This region was born during the breakup of the supercontinent Pangea in the early Mesozoic Era. During the early part of the expansion of the continental crust (about 750 million years ago), a deep basin, known as the Ocoee basin, formed on the margin of the supercontinent what is now the western Carolinas, eastern Tennessee, and Georgia. Seawater filled the basin. Rivers from the surrounding countryside carried clay, silt, sand, and gravel to the basin, much as rivers today carry sediment from the midcontinent to the Gulf of Mexico. The sediment spread out in layers on basin floor. The basin continued to subside, and over a long of time, probably millions of years, a great thickness of sediment accumulated. The sediments of the Ocoee basin now form the bedrock of the Great Smoky, Unicoi, and Plott Balsam Mountains. At the time that sediments were being deposited and mineral deposits were forming in the Ocoee basin, volcanoes were erupting in areas that are now Virginia, the Carolinas, and Georgia. Lava from some volcanoes flowed in slow-moving sheets like lava from the Hawaiian volcanoes, but other eruptions were explosive, like Mount St. Helens. Although volcanic activity ended hundreds of millions of years ago, rocks that formed from these ancient volcanoes are still visible. Fragments that erupted from ancient volcanoes and minerals that filled holes where gas bubbles had escaped can be seen in some rocks at White Top Mountain in the Mount Rogers National Recreation Area of southern Virginia. How did rocks that formed on sea floors and islands become the mountains and valleys of today? The ocean that formed during the continental breakup about 540 million years ago continued to expand. During that time bacteria, algae, and many species of invertebrates flourished in the oceans, but there were no plants or animals on land. Then, about 470 million years ago, the motion of the crustal plates changed, and the continents began to move toward each other. As the continental plates moved closer together, fragments of oceanic crust, islands, and other continental masses collided with the eastern margin of ancestral North America. By this time, plants had appeared on land, followed by scorpions, insects, and amphibians. The ocean continued to shrink until, about 270 million years ago, the continents that were ancestral to North America and Africa collided. Huge masses of rocks were pushed westward along the margin of North America and piled up to form the mountains that we now know as the Appalachians. As blocks of continental crust rode across one another, some rocks became so hot that they melted. Molten rock at the Earth's surface erupts to form either volcanoes or quiet lava flows. When molten remains deep below ground, it cools crystallizes to form bodies of rock that called igneous plutons. Plutons are scattered throughout the Southern Appalachians like plums in a pudding. Some plutons are now exposed at the land surface due to erosion of overlying rock; they weather to form unusual, smooth-sided domes like Looking Glass Rock, south of Asheville, North Carolina. The plutons are composed of granite and similar rocks. When continental masses, islands, and the sea floor collided with the margin of ancestral North America, they were subjected to intense pressure and heat at depth. Where the temperature is high but below the melting point of the rocks, the into bands, and some flow with a consistency like that of toothpaste. In many places along the Blue Ridge Parkway, there are metamorphic rocks with bands of light-and dark-colored minerals, which in some places look like the folds and swirls in a marble cake. Although a collision of continents caused the formation of the Appalachian Mountains, the present-day margin of North America is the result of a reversal in crustal plate movement. After the continents collided, the continental mass began to pull apart. About 240 million years ago, at the beginning of the age of the dinosaurs, a new ocean basin began to form -- the present-day Atlantic. The Atlantic Ocean is still widening today, with the ocean crust pulling apart at the mid-Atlantic Ridge. While the Atlantic Ocean was still in its infancy, the Appalachians were already being attacked by erosion. At the time they formed, the Appalachians were much higher than they are now -- more like the present-day Rocky Mountains. For the last 100 million years, erosion has carved away the mountains, leaving only their cores standing in the ridges of today. Three major classes of rocks common to North Carolina are igneous, metamorphic and sedimentary. North Carolina has a long and complex history. Although much remains to be learned, detailed geologic studies provide a general understanding of regional geological relationships. The State is best described in terms of geological belts; that is, areas with similar rock types and geologic history. Blue Ridge Belt - This mountainous region is composed of rocks from over one billion to about one-half billion years old. This complex mixture of igneous, sedimentary and metamorphic rock has been repeatedly squeezed, fractured, faulted and folded. Inner Piedmont Belt - The Inner Piedmont Belt is the most intensely deformed and metamorphosed segment of the Piedmont. The metamorphic rocks range from 500 to 750 million years in age. They include gneiss and schist that have been intruded by younger granitic rocks. 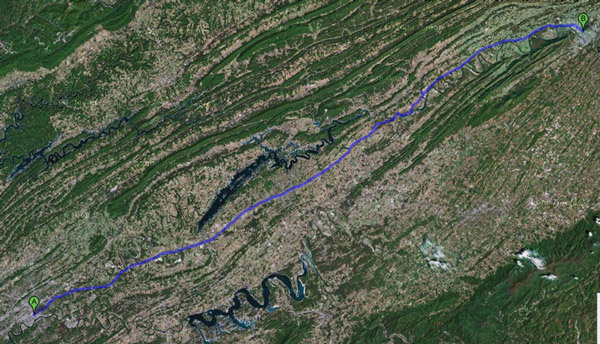 The northeast-trending Brevard fault zone forms much of the boundary between the Blue Ridge and the Inner Piedmont belts. Although this zone of strongly deformed rocks is one of the major structural features in the southern Appalachians, its origin is poorly understood. Kings Mountain Belt - The belt consists of moderately deformed and metamorphosed volcanic and sedimentary rocks. The rocks are about 400-500 million years old. Milton Belt - This belt consists of gneisses, schist and metamorphosed intrusive rocks. Charlotte Belt - The belt consists mostly of igneous rocks such as granite, diorite and gabbro. These are 300-500 million years old. The igneous rocks are good sources for crushed and dimension stone for road aggregate and buildings. Carolina Slate Belt - This belt consists of heated and deformed volcanic and sedimentary rocks. It was the site of a series of oceanic volcanic islands about 550-650 million years ago. The belt is known for its numerous abandoned gold mines and prospects. Triassic Basins - The basins are filled with sedimentary rocks that formed about 190-200 million years ago. Streams carried mud, silt, sand and gravel from adjacent highlands in rift valleys similar to those of Africa today. Raleigh Belt - The Raleigh belt contains granite, gneiss and schist. Eastern Slate Belt - This belt contains slightly metamorphosed volcanic and sedimentary rocks similar to those of the Carolina slate belt. The rocks are poorly exposed and partially covered by the Coastal Plain sediments. The metamorphic rocks, 500-600 million years old, are intruded by younger, approximately 300 million-year-old, granitic bodies. Coastal Plain Belt - The Coastal Plain is a wedge of mostly marine sedimentary rocks that gradually thickens to the east. The Coastal Plain is the largest belt in the State covering 45 percent of the land area. 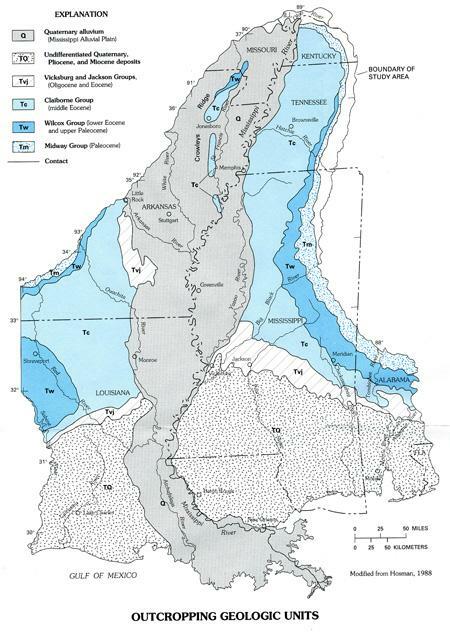 The most common sediment types are sand and clay, although a significant amount of limestone occurs in the southern part of the Coastal Plain. In the Coastal Plain, geology is best understood from studying data gathered from well drilling. The General Assembly of 1979 designated granite as the official State rock. North Carolina is blessed with an abundance of granite. When granite is crushed, it is used as an aggregate for road and building construction. If granite has the right physical properties, it can be cut into blocks and used for monuments, curb stone and stone for building facings. The largest open face granite quarry in the world is located at Mount Airy, North Carolina. Olivine occurs as isolated dunite bodies, or alpine-type peridotites, in the Blue Ridge. Two main districts, the Webster-Balsam district in Jackson County and the Spruce Pine district in Yancey and Mitchell counties, have produced most of the olivine. The deposits contain 50 to 90 percent olivine. North Carolina leads the nation in olivine production, although production is presently limited to the Daybrook Mine near Burnsville in Yancey County. Some molten granitic rock cools very slowly and forms coarse-grained veins called pegmatites. These have been the source of high-purity minerals, such as feldspar, quartz, and mica, and gemstones, such as emerald and beryl. The main uses of feldspar are in glass, pottery, and ceramics. Large deposits of almandite and rhodolite garnet of gem and abrasive quality are known in Clay, Jackson, Macon, Madison, and Burke Counties. Abrasive-grade garnet was produced from some of these deposits from 1900 to about 1926, but no production has been recorded recently. The deposit of almandite garnet in Clay County is in a hornblende gneiss at Penland Bald on Buck Creek. Fine red colored, gem-quality pyrope garnets have been found in the wastes from placer gold operations in Burke, McDowell, and Alexander Counties. Rose-pink rhodolite garnets are recovered from gravels in Cowee Creek near Franklin, and Mason's Branch near Iotla, both in Macon County. Rhodolite can be found in situ on Mason Mountain. Metallic minerals are associated principally with the igneous and metamorphic rocks of the Piedmont and Blue Ridge geologic belts. Ores of chromium, copper, gold and silver, iron, lead and zinc, manganese, molybdenum, nickel, tin, titanium, and tungsten all occur in either the Piedmont or Mountain Provinces. More than a billion years ago, the Black Mountains were formed. This mighty range of peaks once stood lofty and rugged. But over millions of years, wind, water and other forces wore down the pinnacles to their rounded, more subdued profile of today. Only the erosion-resistant igneous and metamorphic rocks allowed Mount Mitchell to retain its dramatic height of 6,684 feet. Because of the even elevation of its ridgeline, the Black Mountain range was referred to as a single mountain until the late 1850s. Of the separate peaks that have since been designated, six are among the ten highest in the eastern United States. Although the Black Mountain range is higher, its length and breadth do not equal that of the nearby Blue Ridge or Great Smoky mountains. 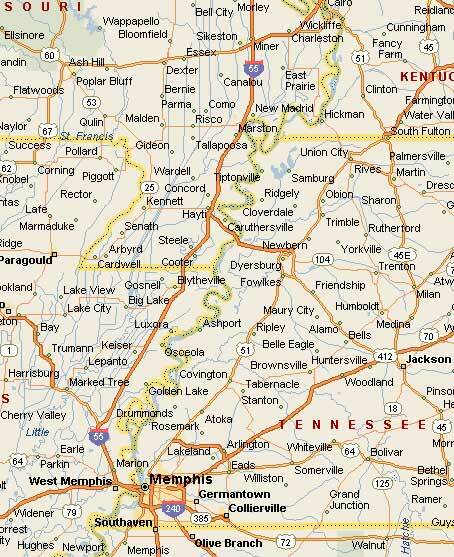 From the air, the range bears the shape of the letter J, and the distance between its end points -- Yeates Knob and Celo Knob -- is merely 15 miles. The Blue Ridge is a deeply dissected mountainous area of numerous steep mountain ridges, intermontane basins and trench valleys that intersect at all angles and give the area its rugged mountain character. The Blue Ridge contains the highest elevations and the most rugged topography in the Appalachian Mountain system of eastern North America. The North Carolina portion of the Blue Ridge is about 200 miles long and ranges from 15 to 55 miles wide. It contains an area of about 6,000 square miles, or about 10 percent of the area of the state. Medoc Mountain is not really a mountain at all; its highest point reaches an elevation of only 325 feet above sea level. It is, rather, the core of what was once a mighty range of mountains. Medoc Mountain is what remains after millions of years of erosion. The eroded peaks were formed by volcanic action during the Paleozoic Age, about 350 million years ago. An elongated structure of biotite granite, Medoc Mountain has effectively routed the streams of the area around itself and has resisted the erosion typical of the surrounding lowlands. The park sits near the fall line, an area where the hard, resistant rocks of the foothills give way to the softer rocks and sediments of the coastal plain. The northern and western faces of Medoc Mountain have very steep slopes, dropping 160 feet over a distance of less than a quarter mile. Such rugged terrain is unusual for the eastern piedmont. Most dimension stone in North Carolina is produced from granite, agrillite, quartzite, marble, and sandstone. The North Carolina Granite Company operates one of the largest granite dimension stone quarries in the world at Mount Airy in Surry County. The Mount Airy granite is a light-colored biotite granitoid (monzogranite). The rock is used as street curbing, ashlar for masonry walls, rubble, rip-rap, monuments, and sawed blocks for buildings. The highest point in North Carolina (and the highest point east of the Mississippi River) is Mount Mitchell. Its elevation is 6,684 feet. The colors of the granite of the Salisbury, North Carolina area range from white to pink. These rocks are sold under a variety of trade names. The white granite of the Salisbury area has been used to face a number of buildings. Stone Mountain is not immediately visible upon entering the park that bears its name, but this magnificent 600-foot granite dome is well worth the wait. Sunlight and shadows dance across a broad tapestry of stone. White-tailed deer emerge from the security of the forest to graze on meadow grasses at the mountain's base. The scenery is only one attraction of the park. Test your fly-fishing techniques in more than 17 miles of designated trout waters. Or, with more than 16 miles of trails, take a hike in the park. Designated as a National Natural Landmark in 1975, Stone Mountain is bounded on the north by the Blue Ridge Parkway and on the west by the Thurmond Chatham Game Lands. More than 13,747 acres of mountain beauty offer opportunities for outdoor activities of all kinds.